Do problems with wet wipes in drains soon belong to the past? Wet wipes (toilet paper, baby wipes, clean wipes etc.) have been one of the biggest unsolved problems in sewage history. They usually enter the canalization through the toilets of private households, clinics, care homes and public areas. This way our sewage establishment (costs and workers) and our environment (micro toxic exposure and poisoned water) has been dealing with many problems. Due to the decrease in water usage from toilet flushing the flow speed of the residual water sinks in the canalization. This means the factors that influenced the dissolution of the wet wipes are now sinking as well. Because of the changing weather circumstances there is a constant switch between extreme rain and dry periods. This means the sewage economy must deal with drastic changes in the dwell time of wet wipes in the canalization through the dry periods. Wet wipes in general have the tendency to intertwine in the canalization if there's no mechanical help and the flow speed is slow. This is how "blockage" is formed. These phenomena increase the problems of the sewage and lead to interruptions and malfunctions of the pump stations. So far there have been some advertisements of products that promise the dissolution of the wipes, but in reality, there hasn't been a product that really made it happen. Current products don't dissolve at all or if they do then only a little bit. If they've only dissolved a little bit, it means their fabric has been destroyed through extreme mechanical power. These destructions of wet wipes have been proven in some tests, but are not used for the current sewage circumstances. Ascutec GmbH & Co KG as producer of Airlaid products has been doing extensive research on this topic for 3 years now. Ascutec GmbH & Co KG has now the ability to create the worldwide first self-dissolving wet wipe. A wet wipe must have enough moist strength, which means it must have at least the same moist strength as the average wet wipes. The wet wipe must pass all dermatological tests. The wet wipe must dissolve at a minimum of the same time as a normal dry tissue paper would in the canalization and no external mechanical powers are allowed as a support, like the toilet flush, gutter pipes etc. Another requirement is that this test must be completed without harming the environment with the usage of plastic fibres or petroleum binders. A complete compostability of the product must be given and the product must fulfill all microbiological requirements. Test results from the research institution IAB in Weimar have shown that the newly developed wet wipe only needs a time frame of 1 minute and 44 seconds in a so-called "endless sewer" to dissolve without any additional mechanical influences (a from the IAB in Weimar developed Test process, ZIM KS 3123301 MF3). This test process simulates a slow flow speed of the sewage in the canalization. In a test in a so-called "slosh box" the time for a full dissolution was only 17 seconds. The wet wipe already has a tear value, that goes way above some of the currently offered wet wipes and this way it is much more convenient as toilet paper, etc. 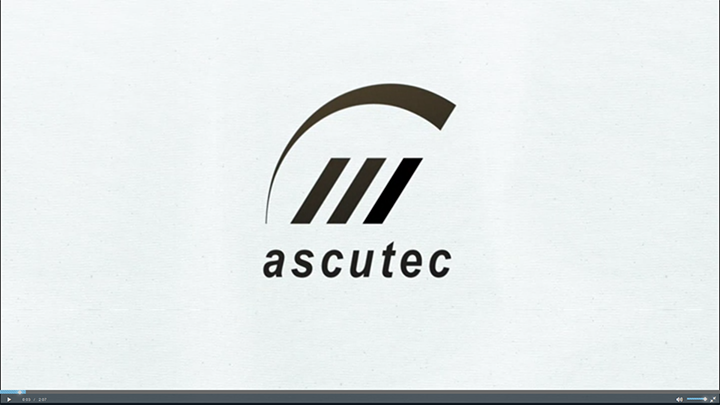 The material used in Ascutec GmbH & Co KG has received a "very good" from the dermatological tests.